Step 1 Place eggplant pieces in colander over your sink. Sprinkle with salt. Leave for 20 minutes as eggplant sweats out its bitterness. Pat dry. Step 2 In a large heavy pot or Dutch Oven like this one, heat 2 tbsp extra virgin olive oil over medium heat until shimmering but not smoking. Add onions. Cook, stirring regularly, until translucent (about 5 minutes). Now add red peppers and green peppers, cook for another 4 minutes, and continue to stir. Step 3 Add garlic, tomatoes, zucchini, eggplant, wine, and fresh thyme springs. Stir in black pepper, paprika, rosemary. Season with kosher salt. Step 4 Raise heat to medium-high and bring to a boil for 5 minutes, stirring once of twice. Turn heat down, cover and cook over low heat for 20 minutes or so. Step 5 Remove ratatouille from heat. Taste and adjust salt to your liking. Add sherry vinegar and a generous drizzle of Private Reserve EVOO. Top with fresh basil. Step 6 To serve, transfer ratatouille to dinner bowls, top each with a fried egg (sunny-side up) and add crusty bread on the side. This easy ratatouille recipe is a flavorful, hearty and satisfying weeknight dinner. 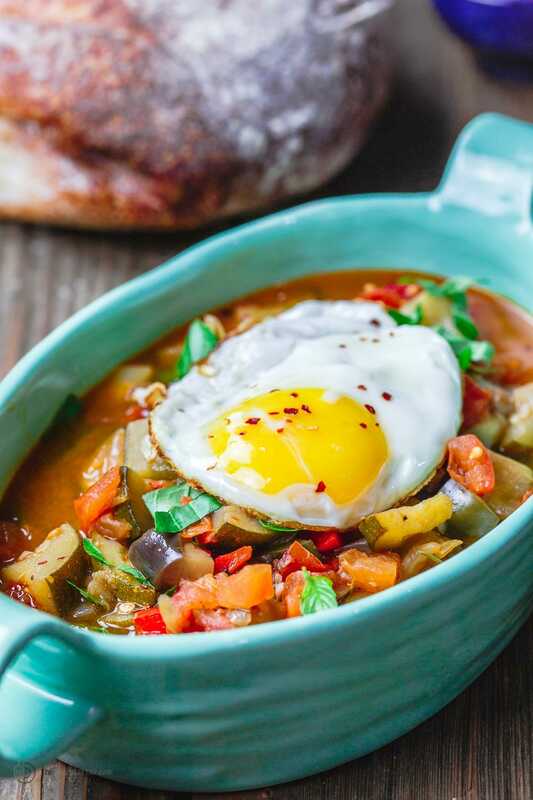 Ratatouille is best served hot with a perfectly runny sunny-side up egg on top. Don’t forget to add your favorite crusty bread to sop up all the goodness.